Glavé & Holmes Architecture is pleased to announce that Tim Hayes is now a licensed architect in Virginia. Timothy J. Hayes, Jr., AIA, is in the firm’s Cultural Studio. He has an A.B. in Classics from the College of Charleston with concentrations in Historic Preservation and Community Planning, along with a Master of Architecture from the University of Miami. In addition to historic preservation, he has brought the University of Miami’s urban planning expertise developed under Dean Elizabeth Plater-Zyberk to Glavé & Holmes with work on projects like the ONE VCU Master Plan and Science Museum of Virginia Master Plan. Tim is currently serving as Project Architect for the renovation of the Fort Monroe Visitor and Education Center, which is scheduled to open this Fall. Glavé & Holmes Architecture is pleased to announce that Michael Hammon has passed the final portion of the Architecture Registration Exam (ARE) and is now a licensed architect in Virginia. Michael Hammon, RA, is a Project Manager/Project Architect in the firm’s Higher Education Studio. With more than a decade of experience, he developed his skills while attending the University of North Carolina at Charlotte where he earned his Bachelor of Arts and his Bachelor of Architecture degrees. Micahel’s portfolio contains a wide range of project types, including K-12, Higher Education, Civic/Government, and Commercial projects throughout the Mid-Atlantic. He is involved with the American Institute of Architects and is currently working on multiple renovation projects for the Darden School of Business at the University of Virginia as well as the renovation of Trinkle Hall at Virginia State University. Housing facilities are an integral part of a University’s ability not only to recruit, but also to retain students. Desirable amenities such as living / learning environments, full-service kitchens, and suite-style living are becoming expected amenities rather than exceptions. To fulfill the expanding expectations of students, Glavé & Holmes Architecture is working with colleges and universities to incorporate current and future trends to enhance the student experience while also balancing the operational costs of these facilities. Our residence hall portfolio includes a range of projects, from small renovations to new 500-bed living/ learning spaces. Originally designed by Ralph Adams Cram, the 66,000 sf, 100-year North Court was built as a residential community for Westhampton Women’s College (now the University of Richmond). Still a popular housing option for students, the University of Richmond recently commissioned Glavé & Holmes Architecture to fully renovate the residence hall. Traditional hall style rooms and common baths were replaced by semi-suite configurations, with expanded amenities for social gathering, study groups, and formal meetings. The original dining hall and large meeting spaces have been transformed to house the music department, with a recital hall, choir room and world music practice room attuned to meet the growing demands of the music department. The interior spaces are warm, inviting and enduring in nature, as was the original intent of Cram’s multi-functional building. The renovation includes new building systems and modifications for code and accessibility compliance. The project also includes a comprehensive remediation of the building envelope to resolve water infiltration issues and increase energy efficiency. Glavé & Holmes is working with the College of William and Mary on the replacement of the existing residence halls known as the Green & Gold Village. The feasibility study explores the options relating to renovation or replacement of three residence halls (Lion, Eagle and Griffin) totaling 112,896 sf. The current bed count is 426 beds and the replacement target is 576 beds. The study developed a phasing plan to accommodate demolition and new construction in order to limit the total reduction of beds all at once. The architectural design will follow William & Mary’s Campus Design Guidelines and Facilities Management Technical Standards and is contextual to the surrounding campus community. In response to a growing student population on this largely residential campus, Roanoke College commissioned Glavé & Holmes Architecture, in association with OWPR, to design a new 200-bed residence hall in the newly developed athletic quad. This innovative facility provides a variety of housing options for students, including four-bed, apartment style suites, with a mix of single and double rooms throughout all models. This variety encourages diversity of housing preferences and price points within the same building and allows for the possibility of a student remaining in the same residence hall throughout his or her entire college experience – transitioning to a more private housing experience from year to year. The residence hall also provides an integrated living / learning experience with classrooms, a seminar room, a kitchen, and faculty office space on the lower level. The exterior design of the new residence hall is influenced by the Collegiate Gothic structures on the campus and maintains the rich detailing of this style with brick and cast stone accents. The building is arranged around a courtyard to form an outdoor room, providing places for residential life both inside and outside the building. In response to an era of nation-wide competition to attract the best students, Christopher Newport University (CNU) has upheld its mission to provide a variety of high-quality student life experiences with the new Rappahannock River Hall. Designed by Glavé & Holmes to be stylistically compatible with other recent facilities, this 450-bed residence hall with an attached 270-car parking garage is targeted toward upper classmen who desire an apartment experience while living on campus. The living units are configured as autonomous apartments, complete with in-unit kitchens and laundry. Although the two, three, and four bed apartments have shared living and dining spaces, each bedroom is intended for a single student and has its own bathroom, providing a balance of privacy and community. To complement the interior program, Rappahannock River Hall has a semi-private garden space intended for student recreation and outdoor living. Viewed as the culmination of the on-campus experience for CNU students, Rappahannock River Hall provides juniors and seniors with a taste of post-graduation freedom with the convenience and safe community of being on campus. Glavé & Holmes developed a design for a new Greek Housing Village of eight fraternity and sorority houses for Christopher Newport University. The Greek Housing Village provides an identifiable home on campus for the Greek organizations. G&HA developed four house models, including a double unit which provides flexibility for CNU to accommodate smaller and larger groups from year to year. Each house has a unique façade to express their individuality within the Greek community, while contextually responding the other classically designed buildings on campus. The first four houses are arranged radially at the end of the green space to create a community atmosphere and a shared “front yard.” The common space serves as a home for annual events and traditions, which lie at the heart of Greek Life at CNU. The houses are inhabited by third- and fourth-year residents and offer a combination of single and double rooms with shared bathrooms. Each house also includes laundry rooms, study spaces, a fully-equipped kitchen, chapter rooms, and public restrooms. The project has been designed in compliance with VEES (Virginia Energy Conservation and Environmental Standards) certification. A neo-Georgian design aesthetic with elements of the Doric Order was selected for the new addition that forms the edge to the Great Lawn expansion to the north and encloses the courtyard currently formed by James River Hall and Santoro Hall. 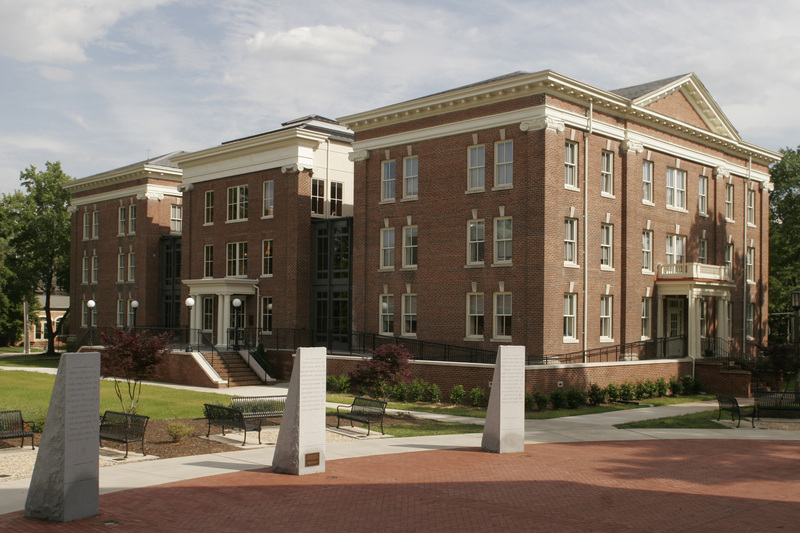 Continuing the architectural language and massing of recent buildings at Christopher Newport University, the exterior wall is brick with architectural precast elements including columns, cornices, and trim. The facility includes 62,862 square feet of new construction with 172 beds arranged in suite-style living where two rooms, each with two students, share a bathroom and living area. Although designated as an “addition” to the existing James River Hall, the building was designed as a stand-alone structure. The building also includes a partial fifth floor within the sloping roof structure. Keeping with CNU’s “Student First” mission, this residence hall includes student amenities such as lounges, study rooms, kitchens, and laundry rooms on each floor. Also included is a central lobby with a staffed reception desk for student security. Additionally, the building houses a Resident Director’s office and a suite for the Resident Advisor. Christopher Newport University hired Glavé & Holmes to study the design and feasibility of a mixed-use expansion of the student housing complex on the north edge of campus. The scope includes the demolition of the existing US Post Office building and Suntrust Tower, followed by the construction of structures to accommodate student apartments consisting of approximately 86 unites with 200 beds. The room models include mostly two and three bedroom apartments. Each bed will be in a private bedroom with a private bath. The bedrooms will share a common living space with a kitchen and laundry facilities. Circulation within the building is through interior corridors, with access control at all entrances. The facility will also include 20,000 sf of office space for CNU, space for a branch bank with drive-through, and an expansion of the existing parking structure by 360 spaces to yield a capacity of 627 vehicles. The project will be located north of the existing Rappahannock River Hall and will include new outdoor recreation space between the two residence halls. Glavé & Holmes designed the renovation and expansion of Thomas Branch, a three-story brick building built in the 1920’s, in response to Randolph-Macon College’s desire to combine existing accommodations for private residential life with new elements supporting student social and academic life. The interior of this building was adapted into new offices and seminar space on the first floor and new student residences, known as the Brock Residence Hall, on the upper two floors. The Brock Residence Hall houses students participating in the Wellness Environment for Living and Learning (W.E.L.L. ), one of the living and learning environments. An existing open courtyard, framed by the three wings of the building, was enclosed to create an atrium. This space includes the Higgins Academic Center, career counseling, and international studies. The original “U” shaped building, which included a parking lot in the courtyard, was programmed to include an atrium space for the gathering of students, the interaction of staff members, and for formal receptions. This group of three residence halls sits northeast of Randolph-Macon College’s historic campus and serves as a center for student life and activities. Oriented around a major quadrangle, these one-story buildings were transformed into an “academic village” connected by new walks and pergolas. New work features enlarged new double-height lobbies, entrance porticoes, new windows, roofs and trim, as well as major interior improvements that create community study and gathering spaces. New mechanical and fire protection systems improve the comfort and safety of these buildings and new lighting, bathrooms, doors and finishes contribute to an enhanced student living environment. In the quadrangle, improvements such as new brick walks, landscape, lighting, site furnishings, plant materials, and storm drainage provide outdoor spaces for recreation, studying, and relaxing. Glavé & Holmes Architecture (G&HA) is pleased to announce the Colonnade Renovation at Washington and Lee University received a Merit Award from AIA Virginia. The project earned the Merit Award in the Historic Preservation category. The historic preservation category focuses specifically on excellence in strategies, tactics, and technologies that advance the art, craft, and science of preserving historically significant buildings and sites. The jury takes into consideration adherence to local, state, and national criteria for historic preservation. Designated a National Historic District in 1973, Washington and Lee University’s front campus is described by the Department of the Interior as “one of the most dignified and beautiful college campuses in the nation”. In the center stands the Colonnade, comprised of the five most iconic and interconnected buildings in the historic district: Washington, Payne, Robinson, Newcomb, and Tucker Halls. Glavé & Holmes’ phased rehabilitation of the Colonnade spanned eight years. With diverse programs, state-of-the-art classrooms, seminar spaces, and faculty offices including Office of the President, the life of every student will revolve around the Colonnade at some point. Always the heart of the University, the deft renovations have pumped new life into each building, guaranteeing their continued place in the heart of future generations. The design team followed the Secretary of the Interior’s Standards for Rehabilitation, preserving character-defining features and respectfully deferring to the existing aesthetic, while upgrading systems throughout. Members of the Colonnade renovation design team will be honored at the 2018 Visions for Architecture gala on November 9. Glavé & Holmes Architecture (G&HA) was recognized by the American Society of Interior Designers / International Interior Design Association for two projects at the Interior Design Excellence Awards ceremony this year. Tucker Hall is the easternmost of five buildings of the Colonnade at Washington and Lee University. The building was constructed in 1935 and is listed on the National Register of Historic Places as a contributing building in the Washington and Lee Historic District. The goal of this project was to create functional, attractive classrooms, offices, and more space for casual interaction, all while preserving Tucker Hall’s iconic image and retaining a sense of its history. The rehabilitation preserved the mouldings, ceiling heights, and checkerboard terrazzo floor of Tucker Hall’s octagonal entry and main hall. Originally constructed as a double-height reading room, a second floor had been installed in the 1980’s. The floor was removed, and significant elements such as the two-story pedimented door and crown mouldings were revealed. The space was sub-divided to create a great hall and two classrooms. Originally designed by Ralph Adams Cram in 1911, North Court is historically and architecturally significant and is listed on National Register of Historic Places. The team preserved the historic character of the building and the integrity of the building’s historic spaces, elements, and materials were maintained. The interiors were upgraded to current standards within the limits of the Virginia Rehabilitation Code. The design is warm, inviting, and enduring in nature, as was the original intent of Cram’s multi-functional building. Materials were chosen to reflect the historic nature of the building, while brightening up the once dark corners of the halls, rooms, and Music Department spaces. The Building Design + Construction rankings are up! The 42nd annual BD+C Giants 300 report ranks architecture, engineering, and construction firms across more than 20 building sectors and specialty services. Glavé & Holmes Architecture is thrilled to be on 12 of those lists and came in the top 40 in three of the categories! We are proud to be listed among many influential firms across the US. Earlier this year, Glavé & Holmes was honored to make the Top 300 Architecture Firms list from Architectural Record and the Top Design Firms list from ENR Mid-Atlantic. G&HA’s mission to “elevate the human spirit” continues to drive us to create meaningful work. Robert J. Parise, AIA, has been promoted from Senior Associate to Principal at Glavé & Holmes Architecture. Rob is a Director of one of the Higher Education Studios at the firm and has led multiple complex projects. He received his Bachelor of Architecture from Syracuse University and has accrued more than two decades of comprehensive design and project management experience. He is currently working on multiple projects at both Virginia Commonwealth University and the University of Virginia, including the new Inn at Darden with Cooper Carry. Rob is also leading the design of a new Visitor Center and Master Plan for Bath County. Rob’s professional development has been spectacular as he embraced increasingly complex and challenging roles on projects and within the firm. Rob does an amazing job of exhibiting the leadership qualities of a Principal, and I wholeheartedly endorse the decision of my partners to promote Rob to this position.